I realized I could do better, and have some fun in the process. What I decided to do was get a small 8U wall-mounted rack, install a properly patch panel for all those in-wall lines to terminate into, and rack mount a proper switch plus anything else cool I could think of. This label would then match up to one on the patch panel. A completed view of the room and cabling, cleaned up. Not quite cableporn-worthy, but I'll take it. For fun, here's a network diagram of the main wired devices in the house. Next step: a rack-mounted stereo amp to drive my outdoor speakers, whose wires also terminate in this room but are currently fished into the adjoining rec room's 2nd zone receiver. Probably wait until spring for this. Also I plan to relocate my HDHomerun Prime to this rack as well. It never really made sense for it to be in my theater rack. 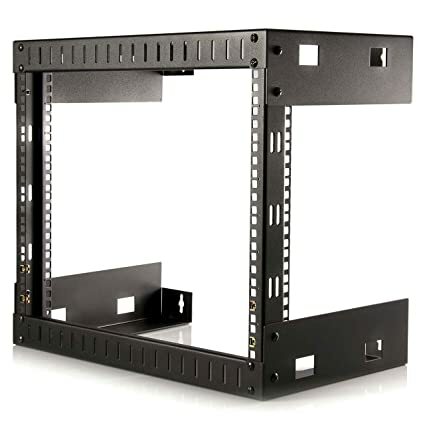 I also have started to dip my toe into Unifi networking products, in the form of a wireless access point in my kitchen (to be detailed in a future post) so I'm looking to replace my current Netgear Nighthawk R7000 router with a Unifi Edgerouter and mount it into this rack. Then I can set up a VLAN for the IoT devices.